So today is a very special day for all the women of this Universe, because its Women’s Day. Whole world is celebrating this day for all beautiful women and Women’ Day itself explain how special they are that’s why this day is celebrated as Women’s Day. I thought of sharing my happiness with all other lovely women and I am proud to be a woman. 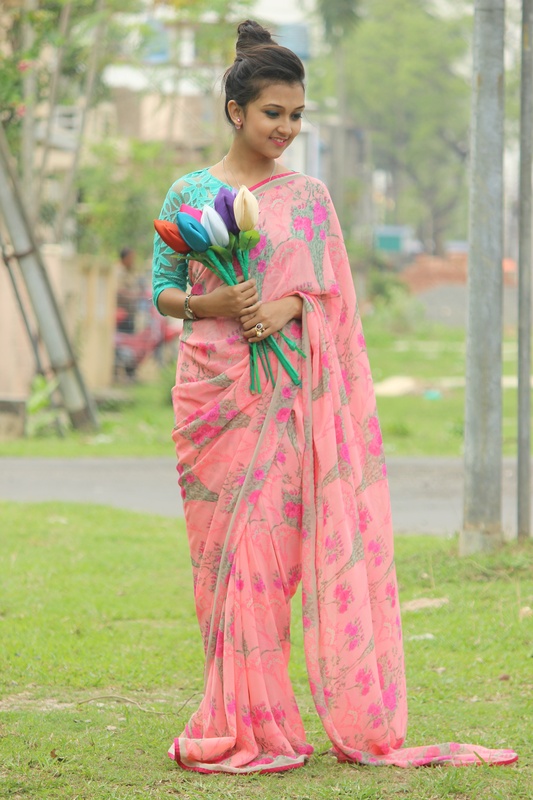 So being a bong girl I choose a beautiful chiffon sari from my mom’s closet as its floral work so I choose, this light colors are so sweet that it makes me happy. I paired up my chiffon pink sari with green lacy see through top which is acting as blouse with this look. As women are like stars they can even sparkle in dark with their hardwork. Even beautiful accessories can sparkle their look. So today I choose absolutely beautiful white and pink stud pendent to make my women’s day more special and this whole credit goes to www.ziveg.com ,this brand made my look more stylish by their beautiful pendent. See you guys in my next post till then keep styling, love you all.